Note: due to a technical mixup, we didn't end up taking a picture of the final form of Iyengar's Utthita Hasta Padangusthasana! 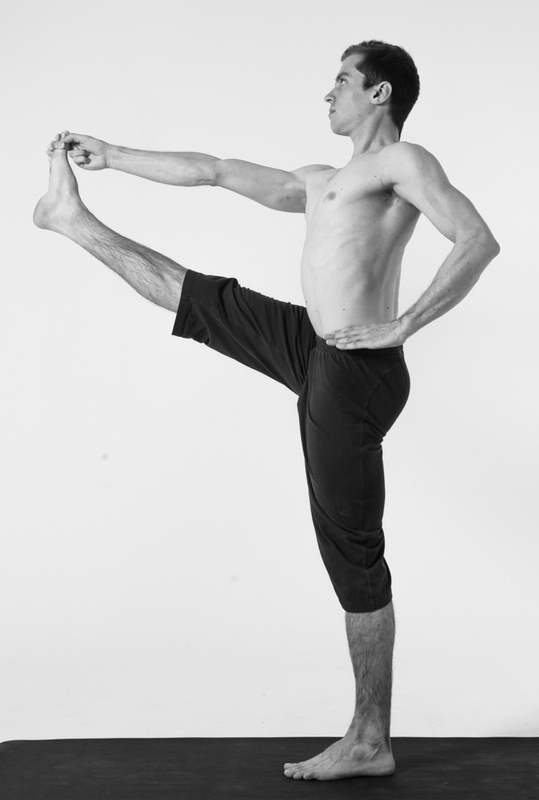 The pictures above are of a prep pose achieved by following steps 1-4 below. Steps 5 and beyond will guide you towards the final form. Raise your R leg, bend your R knee, and hold your R big toe between your thumb and fore and middle fingers on the R hand. Rest your L hand on your L hip. Take two breaths. Stretch your R leg forward while resisting by pulling back with your arm. Then wrap both hands around your R heel and lift your leg higher. Keeping your leg lifting, bow forward and rest your head, then nose, then chin on your R shin. Take a few deep breaths, then return to Tadasana. Iyengar looks much more relaxed than I do! This pose is strenuous for me this early in a sequence. I often need more time and warmth for my leg muscles to release.